Santa Rosa Visitors Center inside the old Train Depot. With as much of a hassle it has become to travel anywhere these days, with long lines, tough security, and fewer and fewer amenities, I always enjoy watching classic movies and seeing how simple travel used to be, particularly train travel. This is just my romantic notion of train travel. I'm sure in reality I would probably be frustrated for different reasons - no smart phone and taking days to get to my destination - but, nevertheless, I fancy the idea of sitting in a train car, lazily watching the scenery pass by as I'm rocked into a nap. 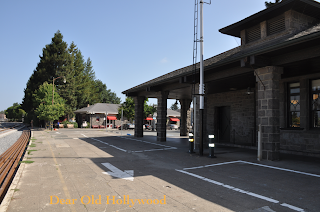 Continuing with highlights from my Fourth of July weekend Northern California trip, this post features our visit to the historic Santa Rosa Train Depot which has been featured in a few films. 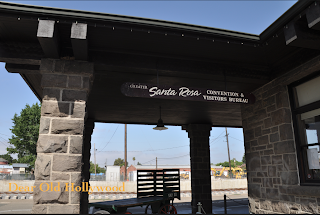 The Santa Rosa Train Depot is located in the city's Railroad Square Historic District or the community's "Old Town." In the early 1900s, this depot served travelers going between San Francisco and Eureka, but with the development of highways and rising car ownership fewer people took the train. Today the train depot is used as the city's visitors center. My main reason for going to the train depot was to walk in the steps of Joseph Cotten, Don Ameche and Steve Martin. 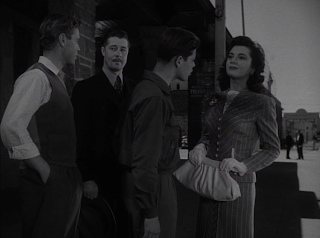 The depot appears in Alfred Hitchcock's Shadow of a Doubt (1943). It's where Teresa Wright's character and her family meet Joseph Cotten when he arrives in Santa Rosa by train. It is also where Don Ameche and Richard Crane see Frances Dee off in the film Happy Land (1943). 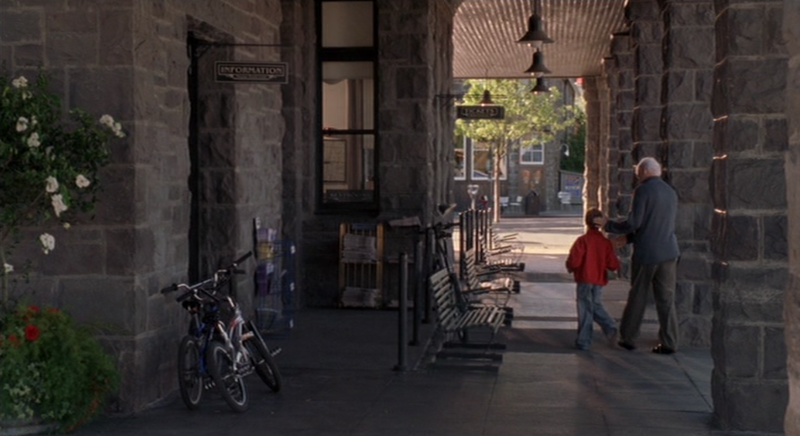 And it is at this train depot that Steve Martin and one of his sons in Cheaper by the Dozen (2003) are reunited with the rest of the family after the son ran away. 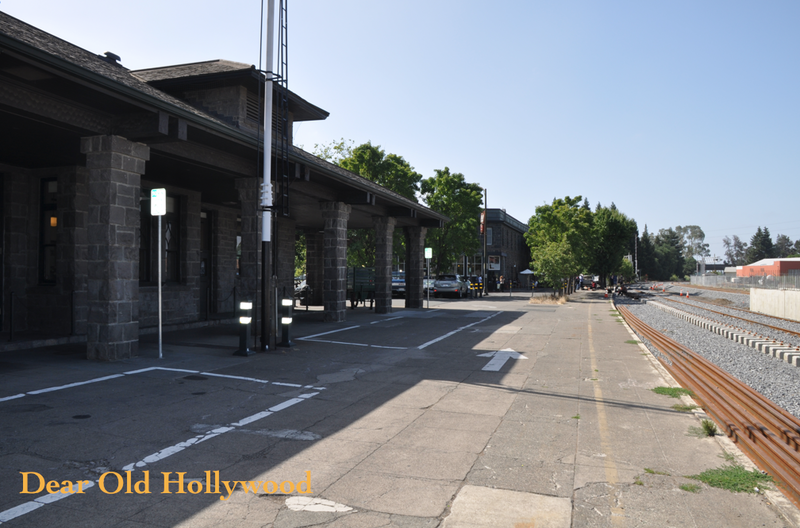 Below are some screenshots from these films and some snapshots I took comparing how the train depot appears today. 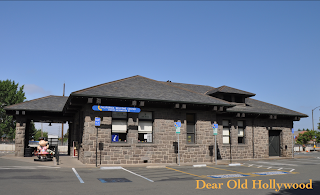 The same view of the train depot as it appears today. Steve Martin walks along the train depot in Cheaper by the Dozen (2003). 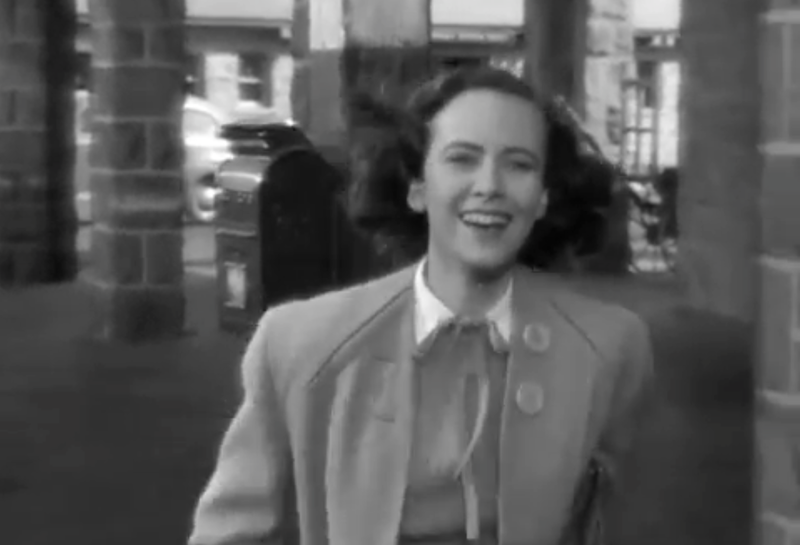 Teresa Wright runs past the depot in Shadow of a Doubt. 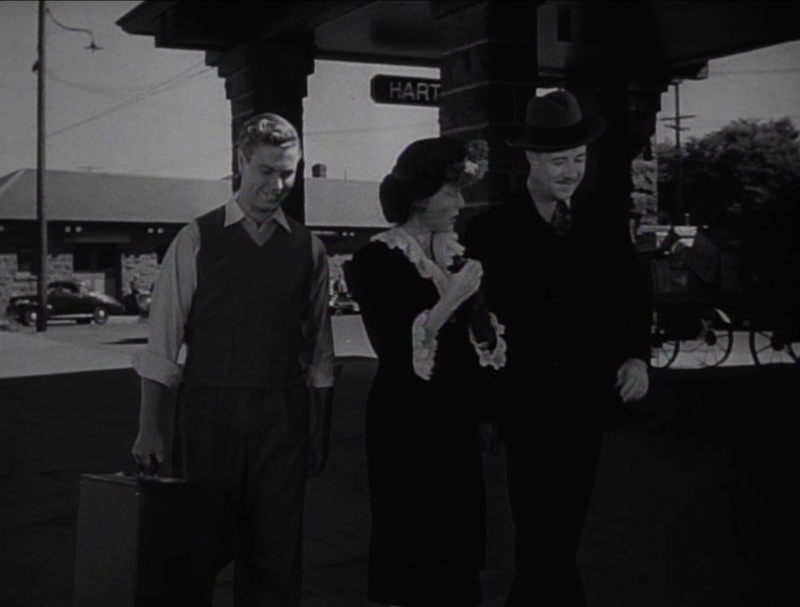 Don Ameche, Frances Dee, Richard Crane at the depot in Happy Land. The same building in the background is still standing. 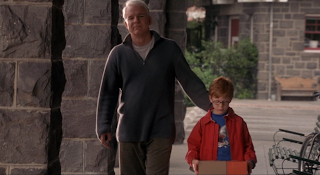 Steve Martin in Cheaper by the Dozen. Santa Rosa Convention and Visitors Bureau. 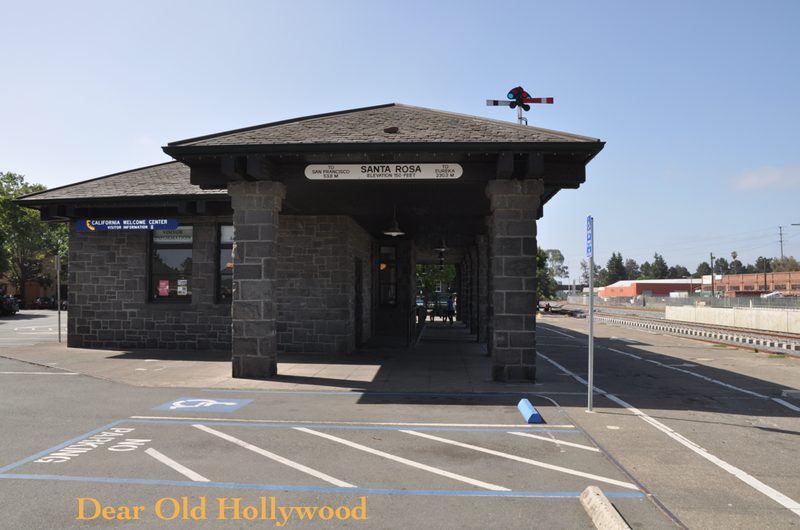 If you plan to visit Santa Rosa the train depot is a great starting point. Inside are a few Santa Rosa themed souvenirs and literature on things to see not only in Santa Rosa but the surrounding area as well. 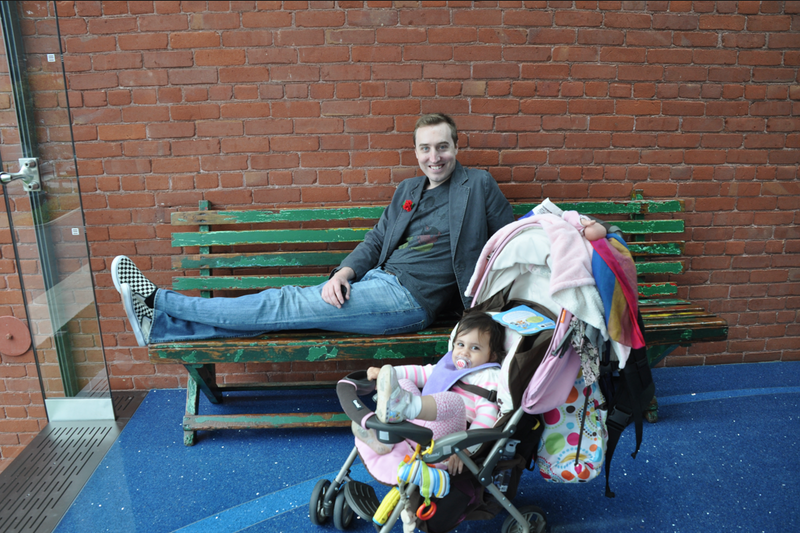 For someone traveling with a baby it was also great to have a place with a clean bathroom, a changing table and bottled water for sale. There is a metered parking lot out front and if you park here it is easy to walk to all the historic downtown locations. Like many people I grew up watching everything Disney. I'm part of a generation that grew up with the Disney Channel on cable. I visited the theme parks growing up. I even worked in the Disney theme parks throughout college. I would read every Disney related book to come out. 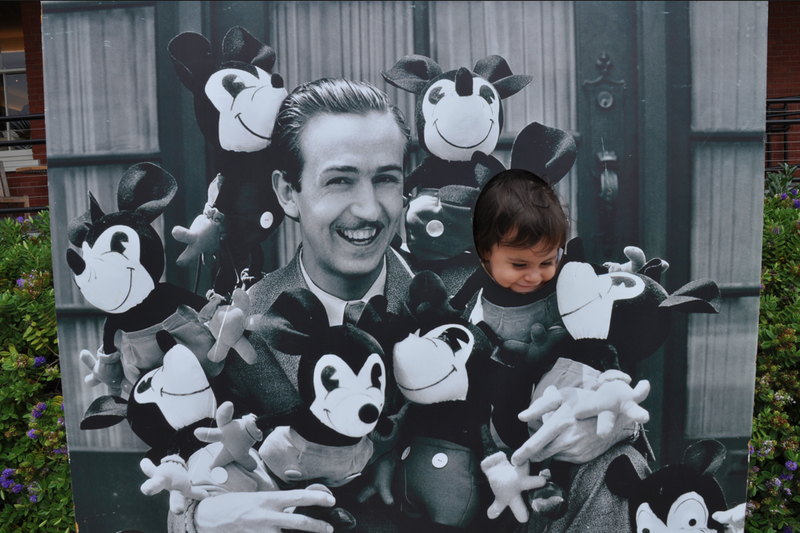 You can say that I have a bit of a fascination with Disney, but not just the company, but also the man himself. Maybe it's because I had a grandpa named Walt who had a striking resemblance to Walt Disney, that maybe sparked something in me as a kid, but for some reason I developed a strong interest in Walt. 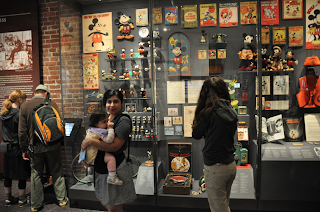 That's why one of the primary stops on my family's Northern California trip was a visit to The Walt Disney Family Museum in San Francisco (to see more of our NoCal stops click here). The great thing about this museum is the focus is on the man and not the corporation that he started. The museum reminds us that this was a guy who drove to a job, had a family, lived a life and wasn't just some corporate icon. 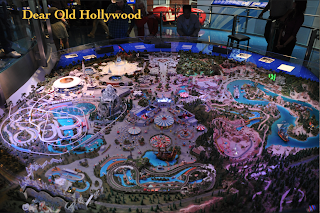 Walt's story is told in a colorful, interactive and entertaining way. All qualities you would expect from something with the name Disney. Here are a few snapshots from our visit. Note: click images to see larger. Zinnia and Hazel walk to the entrance of the museum. 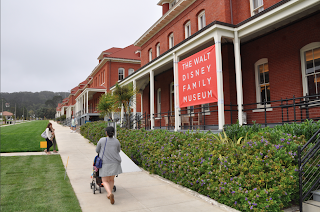 The Walt Disney Family Museum is located at 104 Montgomery Street in the Presidio of San Francisco. This large park and former military base contains many different buildings across the property, of which the Disney museum is located inside one of these large buildings. 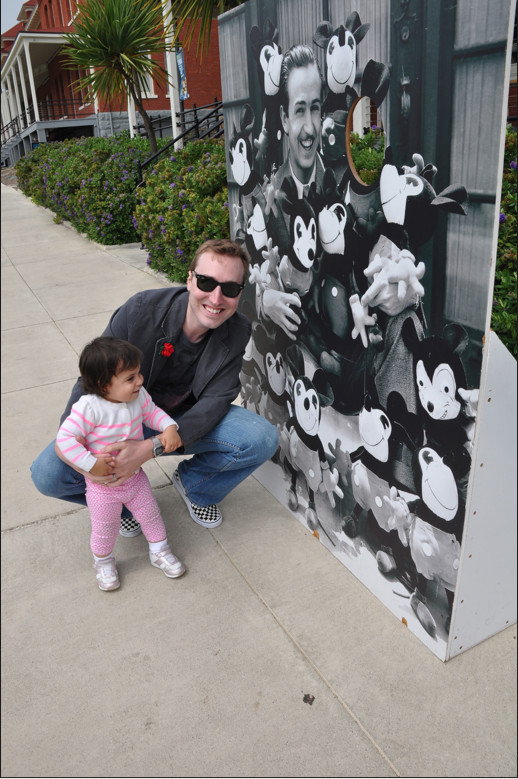 Hazel trying to blend in with the Mickeys. 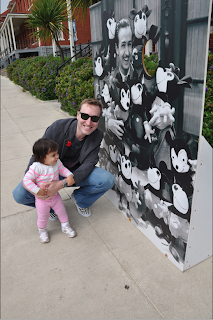 Outside the entrance to the museum was a photo op with Walt and a bunch of Mickeys. 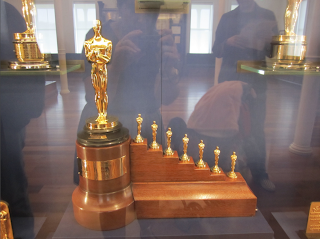 The special Oscar Walt received for Snow White. 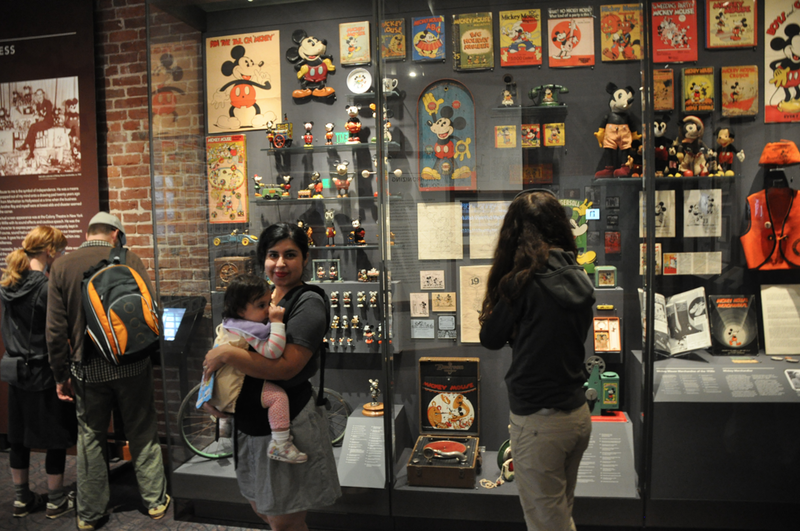 Zinnia and Hazel check out vintage Disney collectables. Robby and Hazel on a Griffith Park bench. The green bench in the above photo is one that would have been located in Griffith Park during Walt's time. Walt was known to take his daughters to Griffith Park to ride the merry-go-round. The story goes that Walt would sit on one of these benches while he watched his kids play and it was during this time he came up with the idea for a place where kids and their parents could play together. One of the fun things about the museum is the further you go the more dynamic the exhibits get, drawing you further in. In 1950, Walt laid railroad tracks throughout the back yard of his Holmby Hills home. Walt had built a working 1/8-scale, coal-fueled steam train, with cars and caboose, that he would take the kids and friends on rides around the backyard. 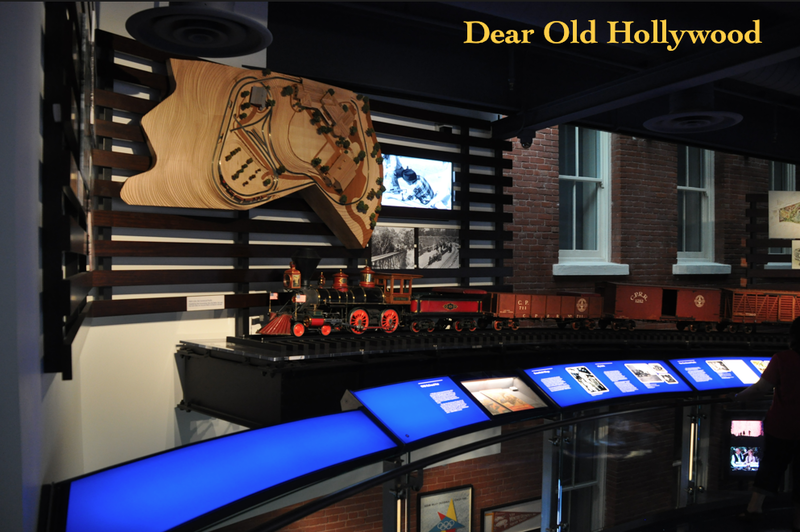 The engine, named the Lilly Belle after Walt's wife Lillian, is on display at the museum. 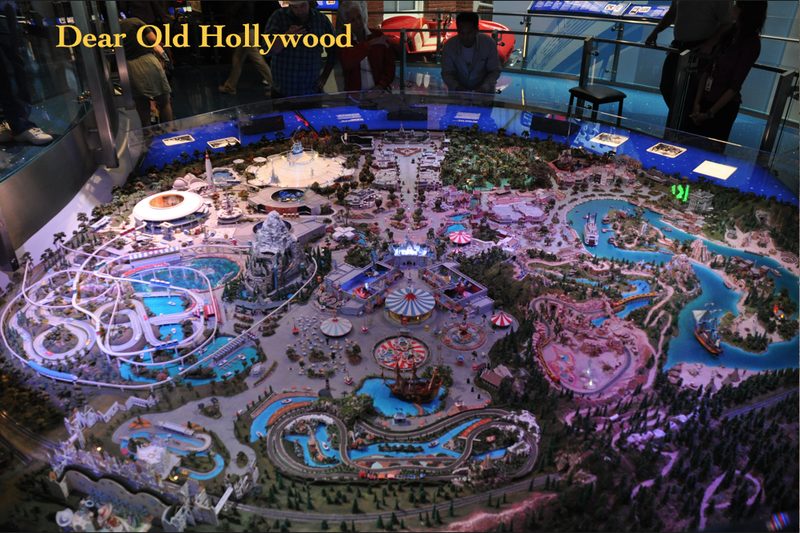 An impressive model of Disneyland. Zinnia and Hazel listening about one of the exhibits. 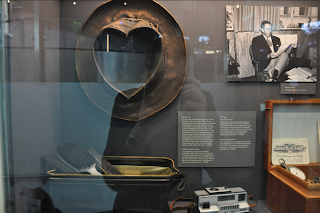 One of Walt's hat's bronzed and shaped into a heart. The hat in the above photo was one of my favorite items. Not that it is anything over the top extravagant, but because of the story behind it. Walt always wore hats. Once, while in Mexico, Walt and wife Lillian attended a bull fight. At the end of the fight all the spectators began throwing their hats in the ring, Lillian grabbed Walt's hat but Walt stopped her before she could toss it in the ring. 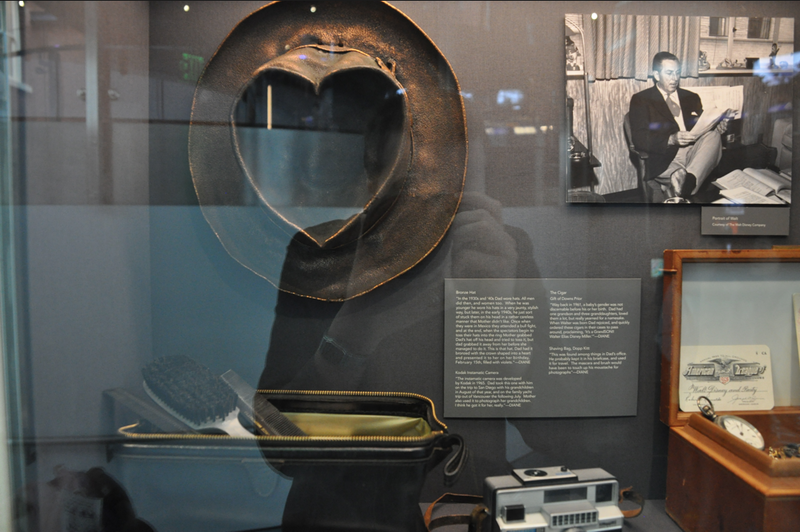 Walt saved his hat and later had it bronzed and shaped into a heart. On Lillian's birthday, February 15, he presented the bronzed, heart shaped hat, filled with violets, as a gift for Lillian's birthday. 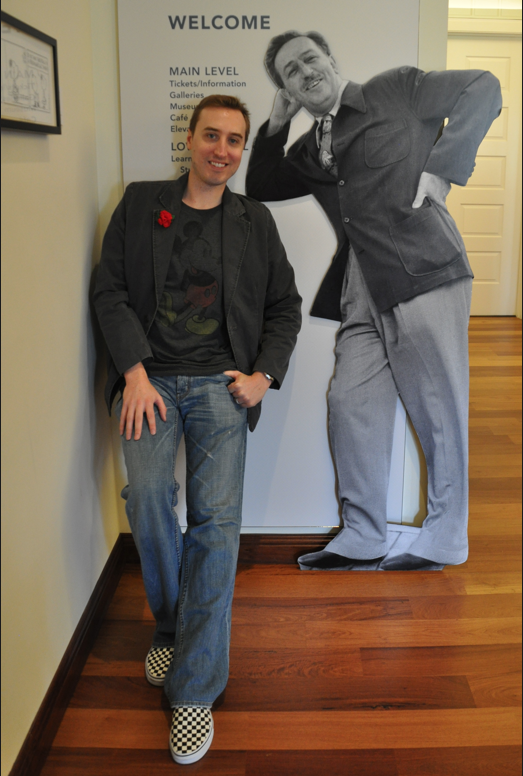 Giving Walt a shoulder to lean on. The Walt Disney Family Museum was one of the best museums I've visited. 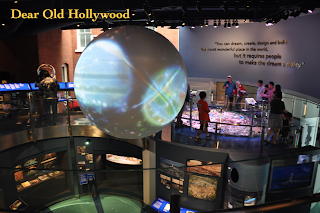 The quality of the displays were excellent and the staff were friendly and helpful. I thank the barista working the museum cafe who willfully filled a bottle of warm milk for our baby without just saying, "no we can't do that" or giving attitude. Also, Hazel fell at one point and had a booboo and a nurse came to check on her. 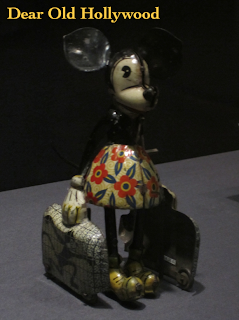 And the two women working in the museum store were very attentive and friendly. They seemed sincerely interested in us as people and not just paying customers. 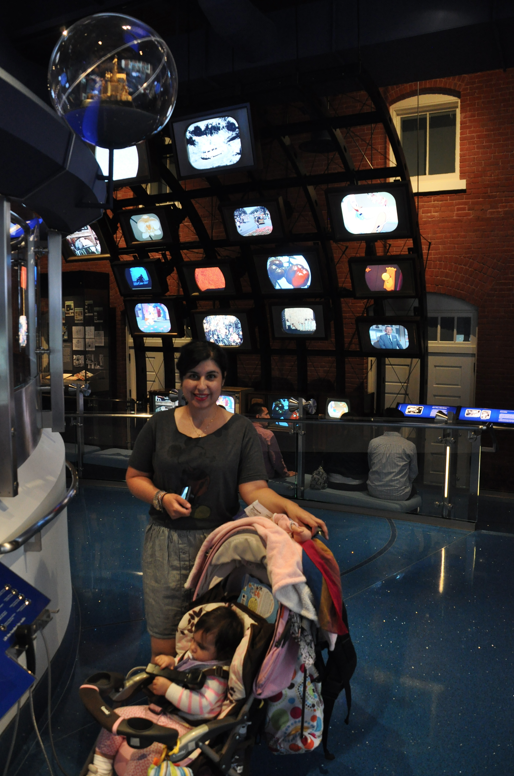 The museum is great for all ages and I highly recommend it to anyone who has not been. There is just so much to see I know I want to go back! Tyrone Power plans his next move. 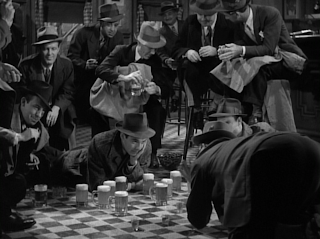 In the film Love Is News (1937), Tyrone Power demonstrates how to play checkers using mugs of beer, shot glasses, and the tiles of the barroom floor. 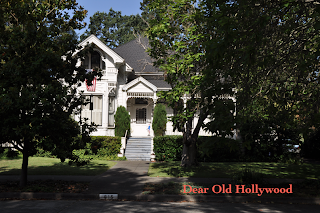 Will this be one of the next Club TCM events held at the TCM Classic Film Festival? 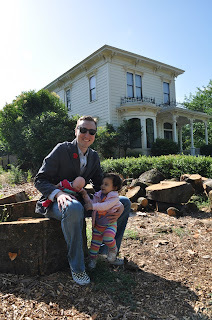 Robby and Hazel in front of the Santa Rosa home used for Alfred Hitchcock's Shadow of a Doubt (1943). This past Fourth of July weekend my wife and daughter and I decided to go on a family road trip up to Northern California. 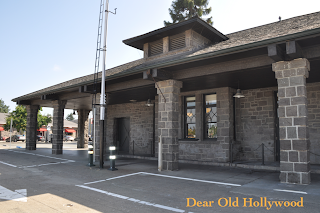 We spent time in three different NoCal cities. Over the next few weeks I'll be sharing some of the film related stops we visited. One of the locations I was most excited to visit was McDonald Avenue in Santa Rosa. 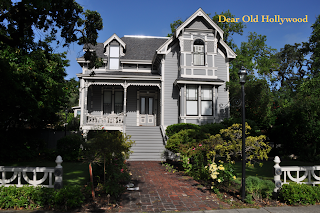 McDonald Avenue, a quiet tree lined street with many attractive Victorian homes, has appeared several times on film, at least as early as 1943. Alfred Hitchcock was one of the first, if not the first, to capture McDonald Avenue on film when he decided to use one of the homes as the primary location for his classic thriller, Shadow of Doubt (1943). At the time Hitchcock made Shadow of Doubt, the country was in the middle of World War II and many supplies used for film sets were being rationed. 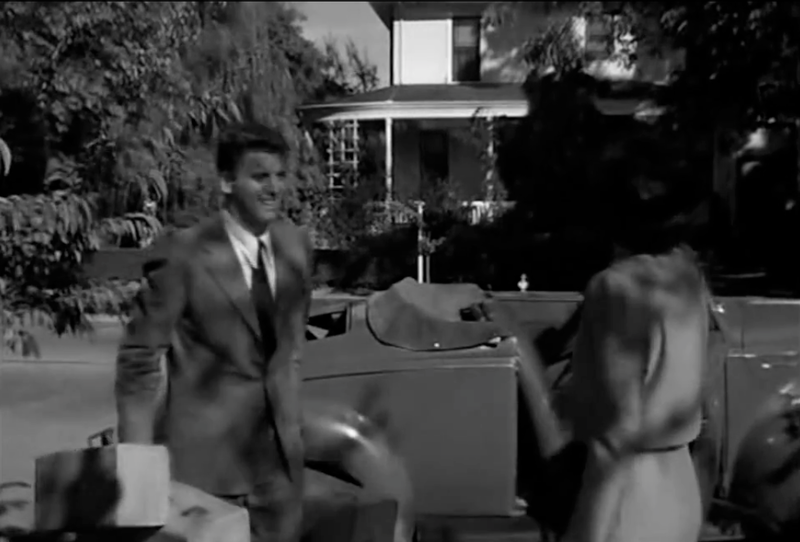 Instead of building many elaborate sets, Hitchcock chose to shoot his film on location. 904 McDonald Avenue as it appears as of July 2013. It's been well documented that the home Hitchcock used for Shadow of a Doubt was a house located at 904 McDonald Ave. It is at this home that Uncle Charlie (Joseph Cotten) visits his sister's family when he needs to hide out from the police. The film stars Teresa Wright, Macdonald Carey, Henry Travers, Patricia Collinge, and Hume Cronyn. 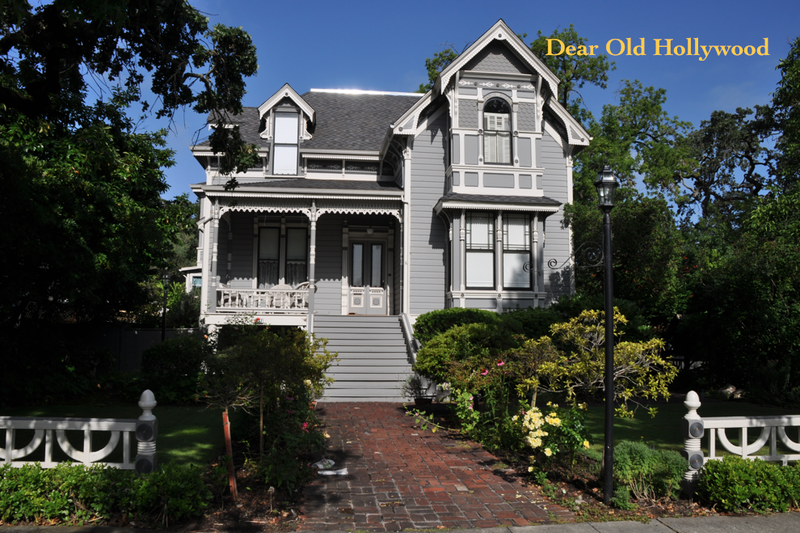 Other than some landscaping changes, the exterior of the home looks very much the same. Teresa Wright and Joseph Cotten on the steps of 904 McDonald Ave.
Across the street from the house used by Hitchcock is the home used in the made for television remake of Shadow of Doubt (1991), located at 815 McDonald Avenue. The remake starred Mark Harmon and Margaret Welsh in the lead roles and Hitchcock star Tippi Hedren had a part as Mrs. Mathewson. Shadow of a Doubt (1991) house. 815 McDonald Avenue. One house south from Hitchcock's Shadow of Doubt home is a house used in the Wes Craven thriller, Scream (1996). 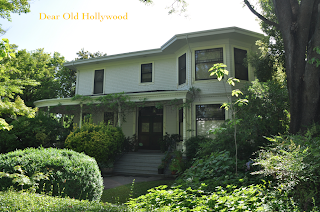 The house located at 824 McDonald Avenue was the home of Rose McGowan's character, Tatum. 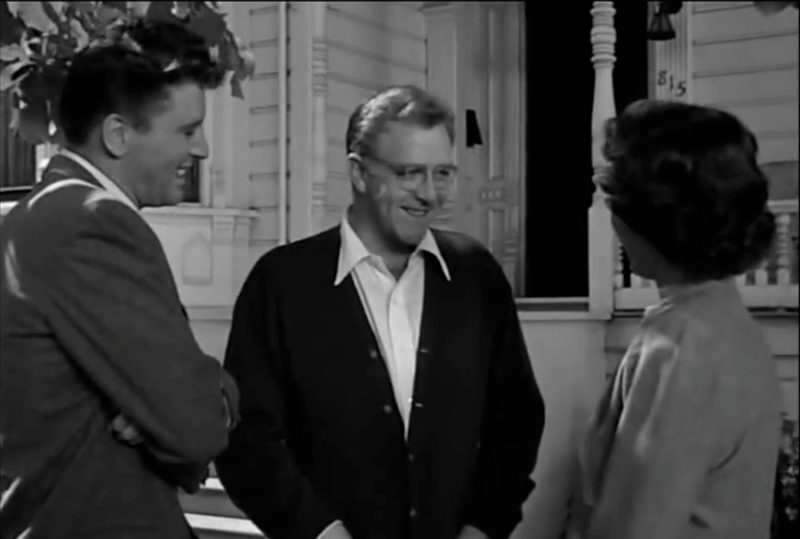 In the screenshot below McGowan can be seen talking with Neve Campbell on the home's porch. According to a San Francisco Chronicle article from 2002, Hitchcock would sit on the same porch at 824 McDonald Avenue and have cocktails with then owner, Judge Donald Geary. Judge Geary's son Bill, who was 13 when Hitchcock came to town for Shadow of a Doubt, said, "He [Hitchcock] used to come over and visit and have a drink with my dad. But Joseph Cotten was a kind of a stuffy guy. He'd have people come light cigarettes for him." Rose McGowan and Neve Campbell in Scream (1996). 824 McDonald Avenue. 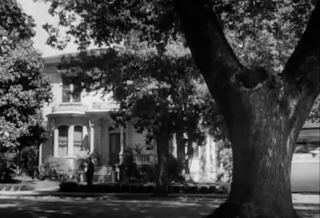 Home used in Scream (1996), All My Sons (1948), and where Hitchcock had cocktails with Judge Geary between filming Shadow of a Doubt. 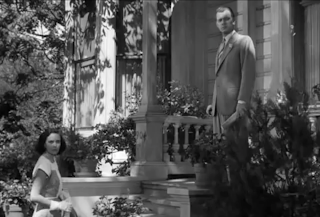 Campbell and McGowan on the porch at 824 McDonald Ave.
Burt Lancaster and Louisa Horton in All My Sons (1948). 824 McDonald Ave in background. 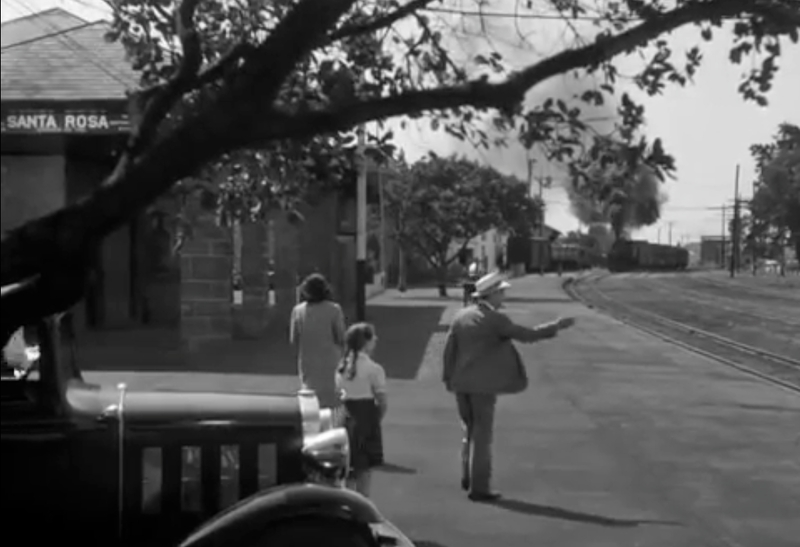 Another film that was made on McDonald Avenue is All My Sons (1948) starring Edward G. Robinson, Burt Lancaster, Mady Christians, Louisa Horton, and Howard Duff. The film also includes a young Harry Morgan (famous later for his role in the television show M*A*S*H) who I will bring up again later in this post. 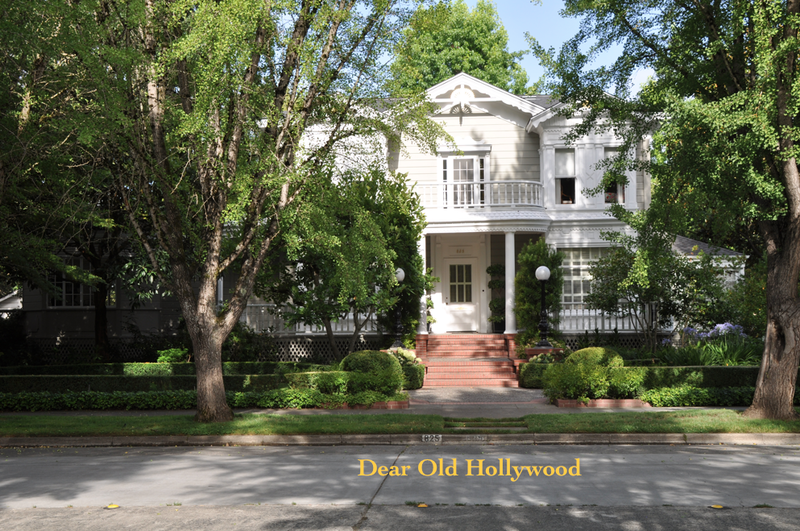 IMDB.com and other sources mention that a home was filmed on McDonald Avenue but no source I found mentioned which home. Using screenshots as reference while walking down McDonald Avenue, I discovered three homes that can be clearly seen in the film. The first home is the house at 824 McDonald Ave. See the screenshot above with Lancaster and Horton. Yes, this is the same house from Scream and that porch is the one that Hitchcock sat at while having cocktails with Judge Geary while filming Shadow of a Doubt. 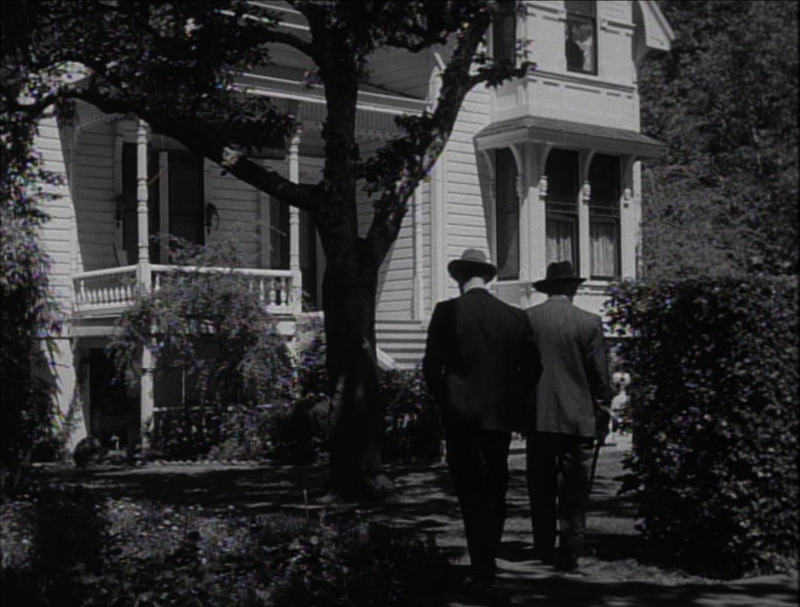 825 McDonald Ave. All My Sons (1948). 825 McDonald Ave. as it appears July 2013. 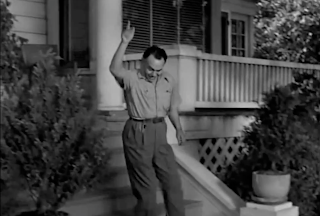 The second home that can be seen in All My Sons is the house located at 825 McDonald Ave. See the comparison above and the screenshot with Edward G. Robinson below. 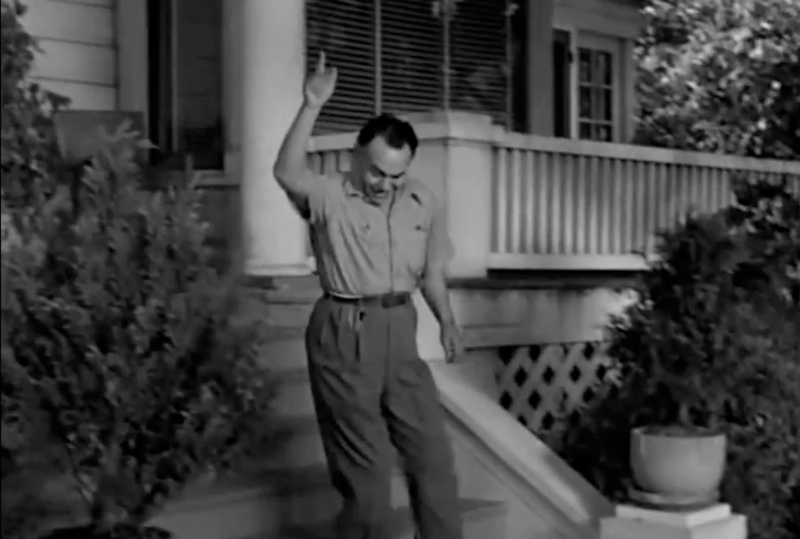 Edward G. Robinson in All My Sons. 825 McDonald Ave. The third home that can be seen in All My Sons is the home located at 815 McDonald Ave. See the comparison below. 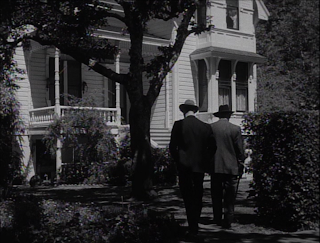 Horton and Lancaster in front of 815 McDonald Ave.
815 McDonald Ave. home used in All My Sons (1948). 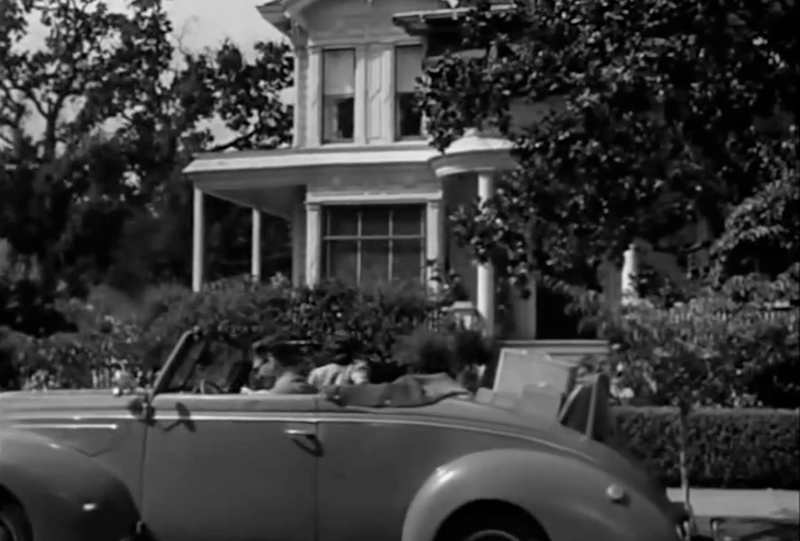 815 McDonald Ave. as seen in All My Sons (1948). 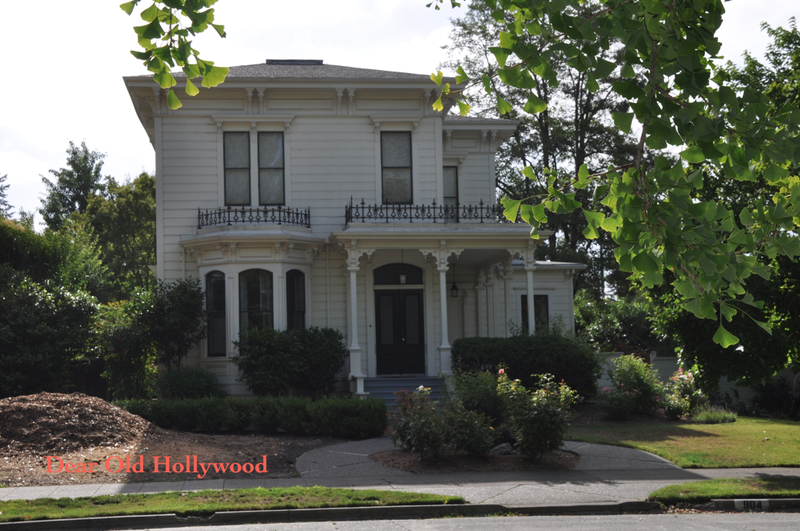 The most prestigious home on McDonald Avenue is the McDonald Mansion (a.k.a. Mableton Mansion) that was built in 1877 as a summer home for the McDonald Family. 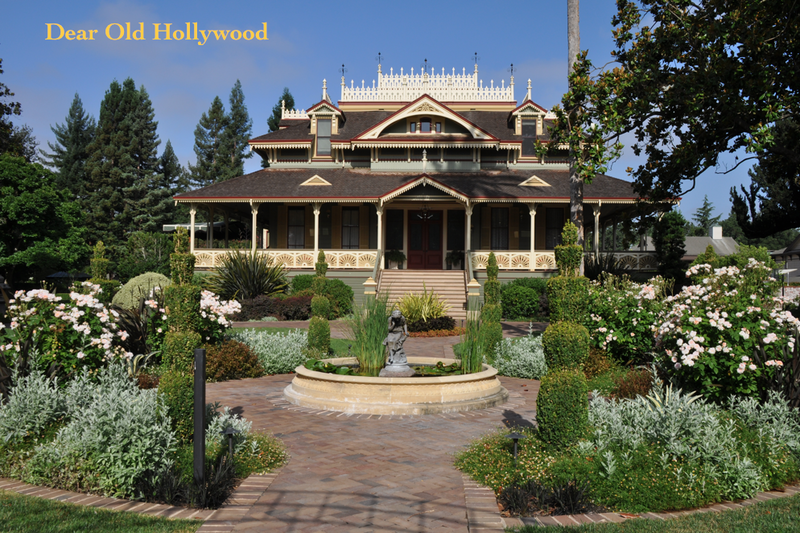 This beautiful mansion located at 1015 McDonald Avenue was used as Aunt Polly's house in Disney's Pollyanna (1960). The film stars Hayley Mills, Jane Wyman, Agnes Moorehead, Adolphe Menjou, Richard Egan, Karl Malden, Kevin Corcoran, Nancy Olson, and James Drury. One thing noticeable right away is that the home used in the film is much taller than the actual house. This is because Disney artists used a matte painting to create the illusion that there were two additional floors. 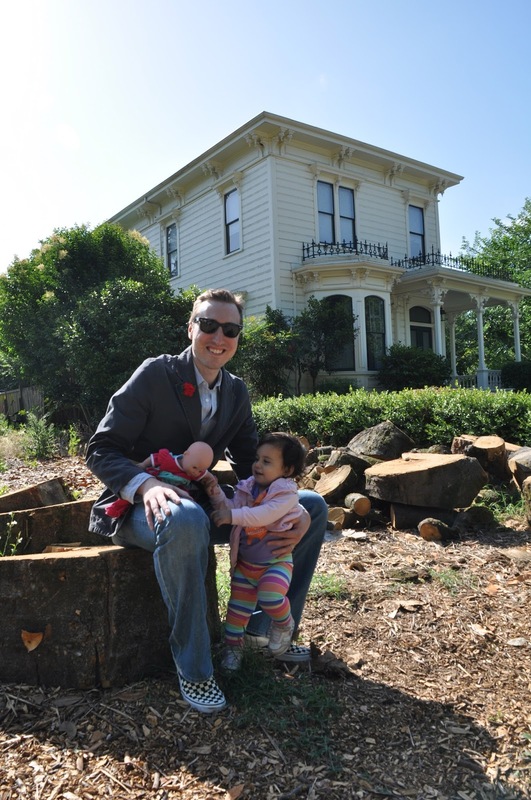 See a comparison of the Pollyanna house below. 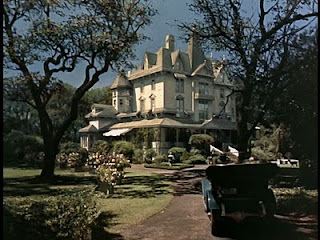 Mansion from Disney's Pollyanna (1960). 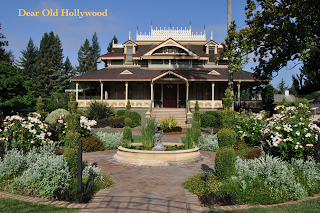 The McDonald Mansion used for Pollyanna. 1015 McDonald Ave.
Me and my little Pollyanna at the gate of the McDonald Mansion. This last film location is my personal favorite. 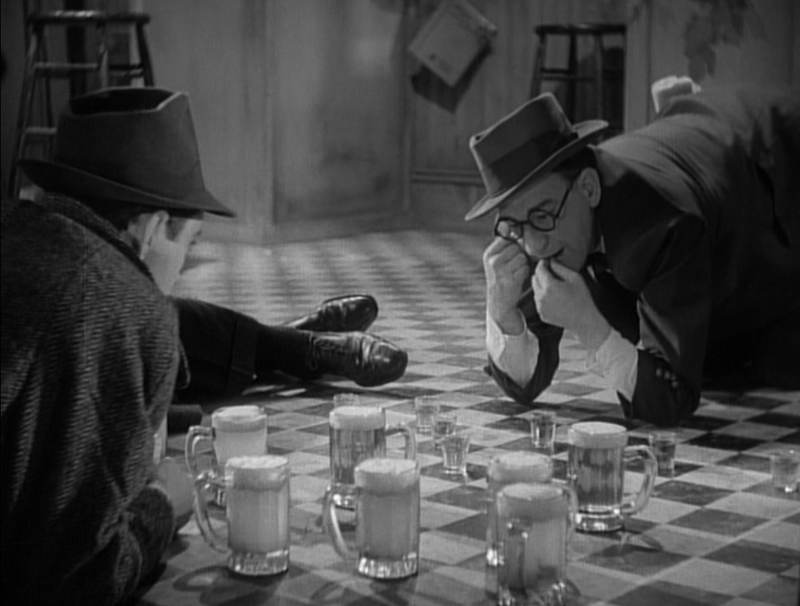 It's from a little known film called Happy Land (1943) starring Don Ameche, Frances Dee and Harry Carey. 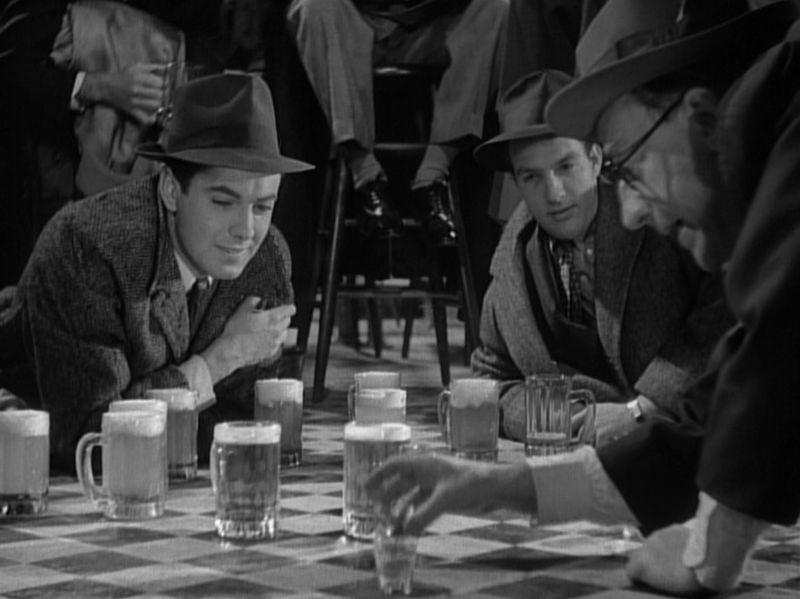 The cast also includes Ann Rutherford, Dickie Moore, a young Harry Morgan and Natalie Wood in her film debut. 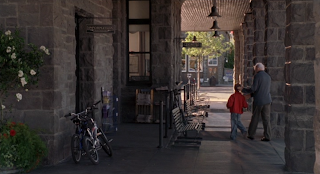 IMDB.com and other sources mention that this film was shot in Santa Rosa, but nowhere could I find where any scenes were filmed, not even any streets. I figured if Hitchcock, Disney, and others all made films on McDonald Avenue that maybe there was a good chance that Happy Land was also filmed on McDonald Ave. Fortunately, my instinct was correct! Before I visited McDonald Avenue, I had used Google Street View to look up and down the street to see if I could find a home that matched the below screenshot. 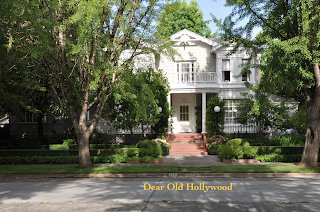 The home of Don Ameche's and Frances Dee's characters is located at 1127 McDonald Ave. I've also found many of the other film locations used in Happy Land that have not been reported anywhere which I will include in a larger post on this movie later. 1127 McDonald Ave. Home used in Happy Land (1943). Both Hitchcock's Shadow of a Doubt and the Don Ameche film Happy Land were filmed in 1943 within a couple blocks of each other on McDonald Avenue. 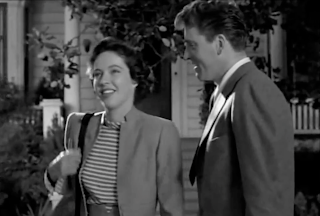 In 1943 actor Harry Morgan was in the film Happy Land and then in 1948 he appeared in the film All My Sons which both filmed on McDonald Avenue. 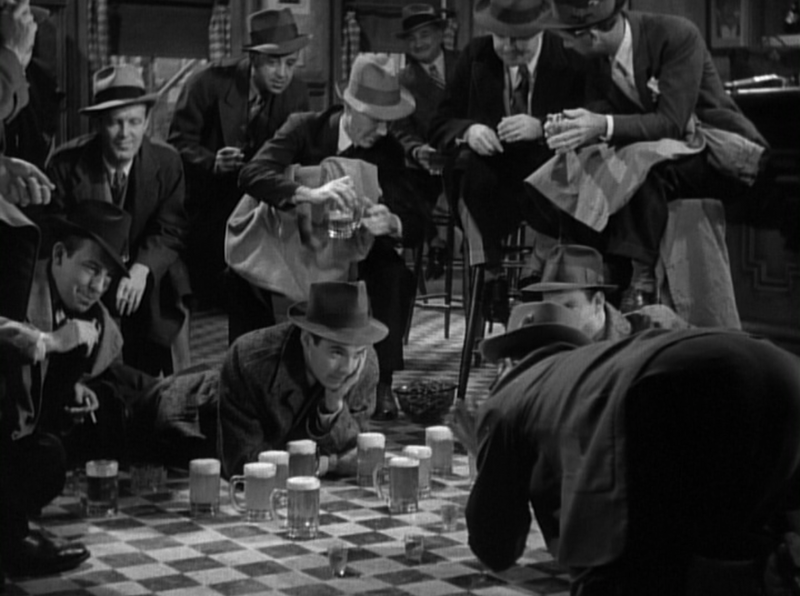 Joseph Cotten was originally considered for Happy Land, but instead appeared in that other 1943 film, Shadow of a Doubt. Wifey and Hazel admire the flowers on McDonald Avenue. Santa Rosa's McDonald Avenue is a beautiful residential street with gorgeous homes. Even if it were not for all the film related connections, this street would be a nice place to go for a stroll. The film history just makes it that much more fun for movie lovers. Check back the next couple weeks for more highlights from our Fourth of July weekend trip.